Sophisticated conjuring brought up close and involving the spectators, where the inexplicable happens in their own hands. Performed silently or as a heavily accented Italian gypsy. Delightfully charming, somewhat temperamental and completely engaging. He has been a professional conjuror since he was fifteen years old. 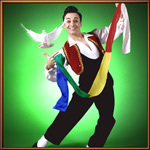 He is recognized as Australia’s most inventive and artistic magician. His training in dance brings a graceful bravado to his strong theatrical approach. Certainly, no other magician can move like him! Also great for shopping centres. Comes fully equiped with stage setting. Elegant illusion to classical music. Light hearted conjuring to an upbeat tango. Humorous capers with audience volunteers. They create an experience on stage that is artistic, impeccably routined and irresistibly entertaining. Doves appear out of thin air. A cooking demonstration receives a pinch of magical flavouring. Eva’s beautiful face vanishes in a burst of flame. Their inventive magic that they have developed baffles not only their spectators, but also their peers. Performing to a broad range of music, from the classical serenades of Mozart played live on solo violin, to contemporary interpretations of traditional Arabian rhythms. Their routines are all meticulously timed to music with the precision of an expert choreographer. Whether audience volunteers are floating on nothing more than ether, or being asked for help with a simple card trick, they are always treated with respect and never embarrassed. Inevitably, they become the stars of the show. Performances can be adjusted in both duration and dimension to fit a variety of scenarios, from shows for intimate audiences to full scale stage productions. A new act or piece of magic can even be ingeniously tailored to fulfill particular requirements. Recognised as one of Melbourne’s finest magicians and corporate entertainers. 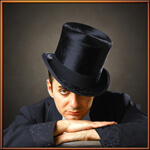 Blending expert sleight of hand and comedy, he leaves his audience astounded and is a guaranteed hit at any function. Renowned for his innovative performances, he is a modern day magician. He has a creative flair that he works into his show, making him a one of a kind entertainer. Weaving his craft in all sorts of venues this Melbourne Magician is heavily sought after for corporate events and private parties. Performing for audiences large and small, he can customise his show to fit any function and audience. No matter how big or small the event he will add life to ensure it is a memorable success. Option 1 Stage show: This is a 45 minute program that is best suited for a large audience. 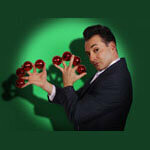 The show is jam packed with stunning magic, audience participation and witty comedy. Performing highly visual illusions with an engaging persona, his stage show never fails to bring down the house. Witness first hand why he is recognised as one of the most innovative Magicians in Melbourne. Option 2 Walkaround/Close-up show: Let him break the ice at your next function by mingling with guests and performing highly visual magic and expert sleight of hand. Perfect for corporate events and private parties, walk around magic is a great conversation starter and will allow your guests to relax and enjoy themselves.